Last month I tried to go for 25 days without spending any money. And it worked. I passed my April no spend days challenge. Here is a break down of all my expenses. April 2nd: Paid mortgage, strata, and some other reoccurring expenses. April 1st was a weekend. April 3rd: Paid $58.24 for internet bill using my credit card. April 12th: Paid $1492.50 for a special levy to clean and repaint the building’s exterior. At least my condo looks newer and more modern now. April 30th: Paid $523.19 for my credit card balance, $29.19 for electricity, and $3.95 for the bank fee. Since I only spent money on 4 days out of 30, I have successfully completed my 25 no-spend-days challenge \(^_^)/ It was easier than I expected. Most of my time in April was spent either at home, or at work, so there wasn’t a lot of opportunities to spend money anyway. Below are my April bank and credit card statements so you can see the details of my spending for yourself. I had to censor some sensitive information like my account numbers obviously but I kept visible the relevant bits to this post. 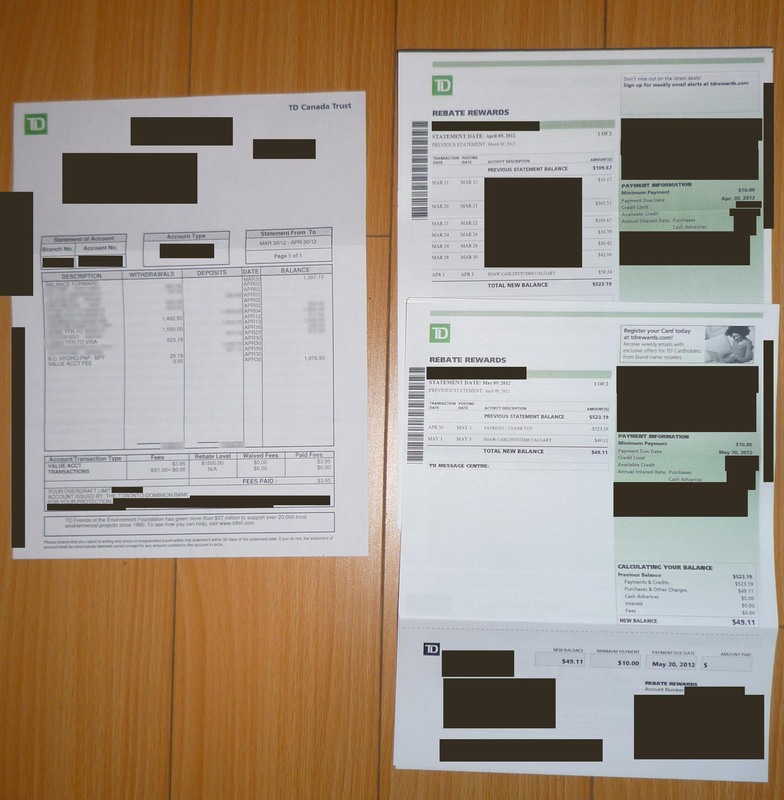 The only withdrawal transaction I didn’t include with my expenses was a transfer of $1,500 on April 16th, from my bank account to my brokerage account. I don’t consider that to be an expense because I haven’t used the money to buy anything yet, only moved it around between my own accounts. My credit card billing cycle ends mid month so that’s why I included two credit card statements. If I had a family then I would have failed this challenge for sure. But as a single adult, I don’t really need to buy a lot of stuff to be happy. The basics I want are shelter, food, transportation, and internet. Once these aspects of my life are met to a certain standard, I think everything else is a luxry ( ･_･). I didn’t buy food in April because I still had lots left over in my pantry and fridge, plus there are other places to get a free bite to eat like open houses, Costco, and sometimes even on the job (my workplace has a basket of oranges and bananas, free to all employees,) I usually commute by car but since mine is really fuel efficient I only buy gasoline once every 50 days or so. I don’t drink coffee, or smoke, or buy apps for my phone. I also don’t mind cooking all my meals at home. In fact as recent as 6 years ago when my living condition wasn’t as comfortable as they are now I had to eat almost every meals at home, couldn’t afford a car or even a cell phone, and had really slow internet. Today however, my lifestyle situation is much improved (^_^). I even have a blu-ray player now. But I think old habits are hard to change because I don’t feel overly constrained about my old ways of spending. During the no-spend month of April I also lost 8 lbs because I was eating more healthy. I didn’t eat out at all. I incorporated more fruit into my diet (from work), and had smaller meal portions in general. So the best part about this no-spend experience has been about health, not money. No spend days are a great way to save for those with a habit of frequent, but unnecessary spending, but it’s not really effective for someone who doesn’t often spend money anyway. I’m glad to have done the challenge but don’t plan to do it again any time soon. For the Month of April I challenge myself to 25 no-spend days. Random Useless Fact: For every $100 spent at a locally-owned business, $68 stays in the local economy compared to only $43 if spent at a national chain. There are lots of great suggestions out there for saving money. One I’ve found particularly useful is making a budget. This post is to help personal finance beginners to think about money, and take control of their own financial situations. A budget is a detailed plan for the formula below. For more savings we just need to increase income and decrease spending. In my experience it’s usually easier to spend less than to make more because (A) it’s physically easier to not buy something than to work for extra money, and (B) savings aren’t taxed. A $100 salary raise means I only get to see $60 of it after paying income tax and CPP/EI/DCPP. My marginal tax rate (30%) isn’t even that high. People who make more than me, and work in a higher taxed province like SK, MB, or ON, probably only get to keep half of their raise, especially if they also have union dues, taxable benefits, and other deductions (ಠ-ಠ). In the US, just replace the Canadian payroll taxes with Social Security, Medicare, and Unemployment Tax. Of course making more money is always a good thing (^o^)丿but there’s an old saying that goes “A penny saved is worth two pennies earned.” To the right is a simple example of how a budget works. To implement a budget, spend one month first tracking all income and expenses. Then study the results and find ways to decrease spending, and if possible, increase the income. Finally set reasonable goals and limitations for future months, and stick to the budget and don’t overspend. If I pay Telus for my phone, and Bell for my internet, then by looking at both of these expenses together on a budget it’s easy to see that I can simply consolidate these services with just one company, and get a bundled discount. Besides tracking just our financial progress though, budgets also teach us to be mindful of our habits so we can make better lifestyle choices (^_^) If I unknowingly ate too much food last month, I can easily spot the inflated food spending in my budget, which would help to explain the extra pounds I’ve put on lately. This is only an example of course. I have a fixed amount in my head of how much in total I should spend each month. Here’s a look at my spending categories. I changed the name of my employers to Job 1 and 2, and blurred my numbers so my friends in real life who know how much I pay for strata fees, for example, won’t know this is me. But for curious readers I’ve left some numbers (which shouldn’t jeopardize my anonymity) visible from January, which was a typical month of spending for me. Budgets are quite fun actually. This is my 3rd year doing them. It’s really interesting when I compare my numbers today with the past. Budgets can be as simple or detailed as you want to make them. But as life gets more complicated, so will the budget. I have roughly 30 categories for my expenses. About half are fixed and the other half are optional. Every budget is personal and unique depending on each person or household. Saving is important. Without savings, one cannot even invest. Most of my net worth today is thanks to my special saving method. Actually, there’s nothing special about it, but it works for me. Below is a chart of my after-tax income and spending history over the last 3 years. The difference between my income and expenses, as you can imagine, is what I save and invest. The trick is to increase my income faster than my expenses. The bigger the difference the bigger the savings! Ignoring my part time job for now, I was making about 35 to 40 thousand gross from my main employer in 2009. Due to tough economic times, I managed to live off about 70% of my take home pay and saved the rest for emergencies. 30% of net income may seem like a big savings rate to some, but according to our government, the average Canadian in my age group (20-24) only made $20K per year or less. After reviewing my needs vs wants, I budgeted my spending in 2009 based on a $25K salary. Because if the average young individual like me is able to live off $20K a year, then there’s no reason why I can’t live off $25K. Since I was actually making more though, I just saved the surplus. If I don’t need the extra money right now, it’s probably best to invest it so I can spend it in the future on something important. However since 2009, my expenses have gone a bit. Career changes, marriage, moving, increased social status, and starting a family are great reasons for lifestyle inflation, but none of those things have happened to me yet. I support lifestyle inflation when it adds value to our lives, but simply making more money shouldn’t be an automatic signal to increase spending. 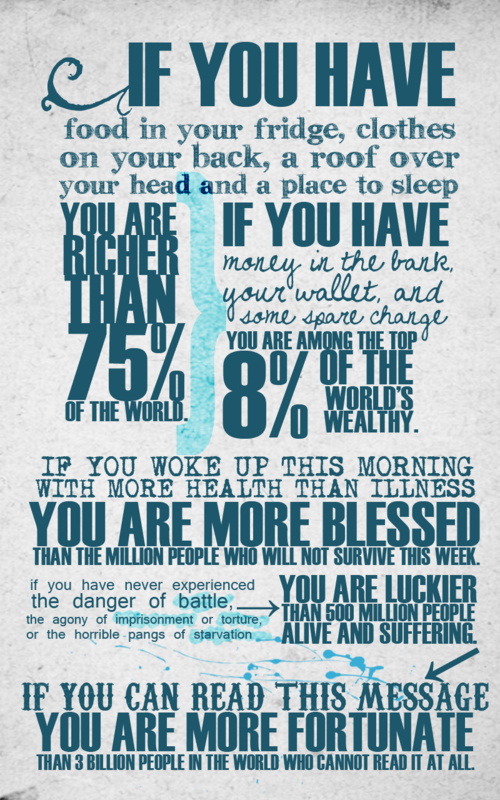 Sometimes we need to step back, and look at the world from a wider perspective to understand the bigger picture. Many “assume” that most people’s cellphones are smart phones today because you see them everywhere. But studies show the adoption rate is only 30% world wide, and maybe closer to 50% in US and Canada. It only seems like everyone has a smart phone because people with old cell phones like me don’t use ours as much in public, (^_^;). When I step back I also realize that my friends are not “average” because they earn and spend more than the typical working class citizen. If we zoom out further and look at my situation from a global perspective, do I really have the right to complain about being underpaid when I have friends and relatives from over seas working longer hours than me but making just a fraction of my pay? Billions of people make less than $2 a day and have to grow their own food. I’m fortunate to have won the geographical lottery and live in Canada. That was pure luck and had nothing to do with my own decisions. But if I have a home, a car, internet, cellphone, clean water, delicious local eatery, and the freedom to pursue happiness, then I think my lifestyle is already pretty extravagant relative to most people in the world. Even compared to other Canadians, I have a pretty average life, and there’s nothing wrong with being average right? And that’s my saving strategy, basically just a reflection of the points below. It’s not a secret, just a simple mind set to follow. There’s no right or wrong to justifying a purchase, but your perspective makes it so. Spending habits should be dictated by one’s values, not income. If people spend too much, they should tweak your values. View situations from different perspectives and only buy things that will add the appropriate value to your life.